Will Apse spent many years renovating older homes and also ran a small construction company. This is page has grown to be a beginner's guide, after a string of questions from readers, so feel free to skip the stuff you already know. One thing that you are sure to be aware of is that air compressors are a pain in the neck (and ear). The increasing power and falling prices of cordless and fuel cell powered nailers have made them an attractive alternative. They can handle most of the jobs that a pneumatic nail gun can, dealing with hardwoods as well as soft woods, and they will work all day. You will also get absolute consistency in nail depth (not guaranteed if you try to use a simple air tank with an air nailer). If you hate the noise of a compressor and get tired of tangled hoses, these machines are a blessing. Which Kind of Nail Gun do You Need? Framing Nailers are tough, very powerful nailers used mainly on construction sites that use big nails to fix structural timbers together. 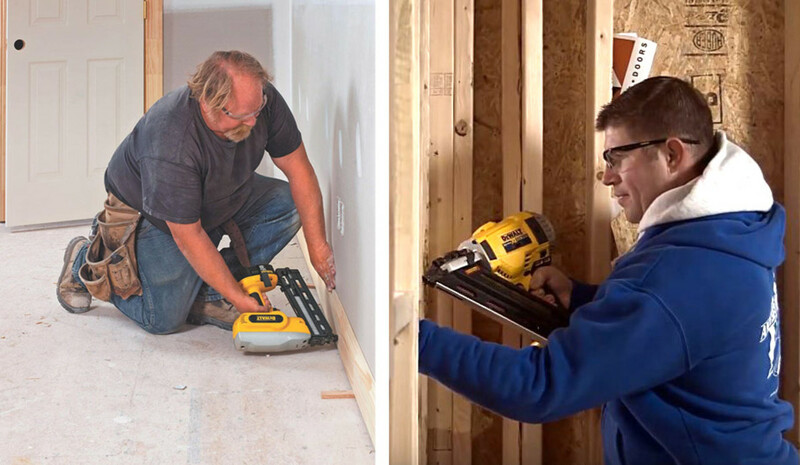 Brad or Finish Nailers are for finishing work like fixing moldings, baseboards or tacking down ply or other sheet material. 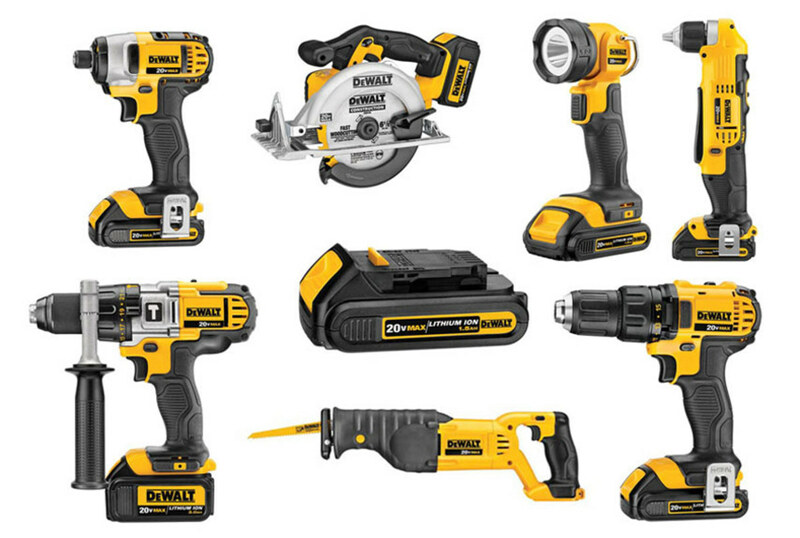 Cordless nail guns can be powered by batteries or fuel cells. How do Battery-powered Nail Guns Work? They have an internal compressor. The battery-powered motor drives a piston that compresses air and this is released to drive the nail home. 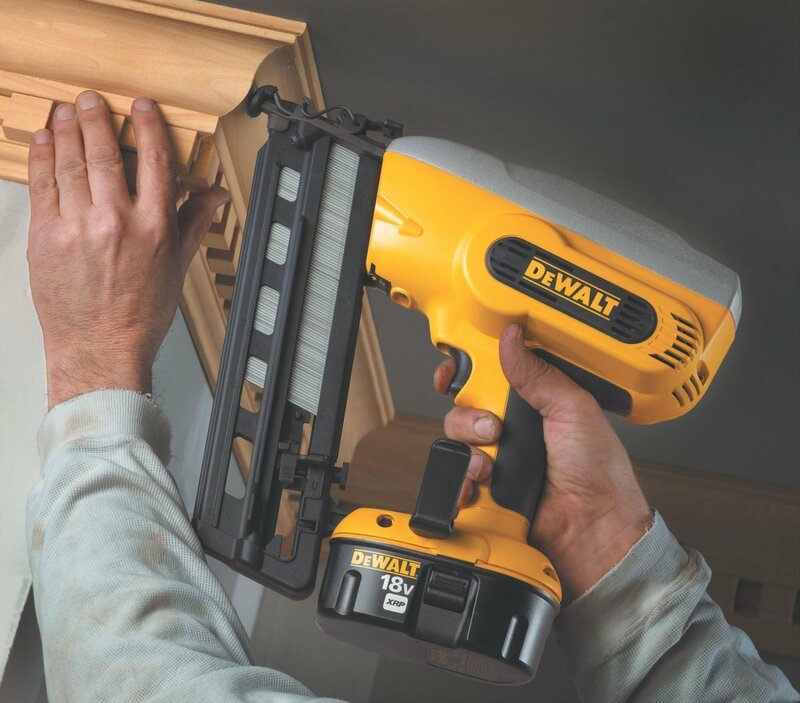 Battery-powered nail guns feel more like ordinary air-powered nailers in use without the problem of hoses and compressors to worry about. How do Fuel Cell (Gas) Powered Guns Work? When you shoot a nail, a small amount of fuel is injected into a chamber. A spark supplied by the battery causes a miniature explosion and the power from this drives home the nail. Fuel cell powered nailers deliver more power for the same weight of machine. This can save you aching shoulders, and help you get a lot more work done. You need to keep on buying fuel cells and this adds to ongoing costs. The gas chamber needs regular cleaning. The fumes from the burning fuel (usually a mix of butane and propane) can be unpleasant in confined spaces. Angled versus straight finish nail guns. Weight is a big factor when you are choosing a nail gun. The more powerful machines can weigh up to ten pounds. This can be tough if you are going to be working over your head a lot of the time. Look out for 'bump mode' and 'timer mode' if you are choosing a finishing nailer. These are useful features when accuracy is not important but a lot of nails are needed to hold something in place. 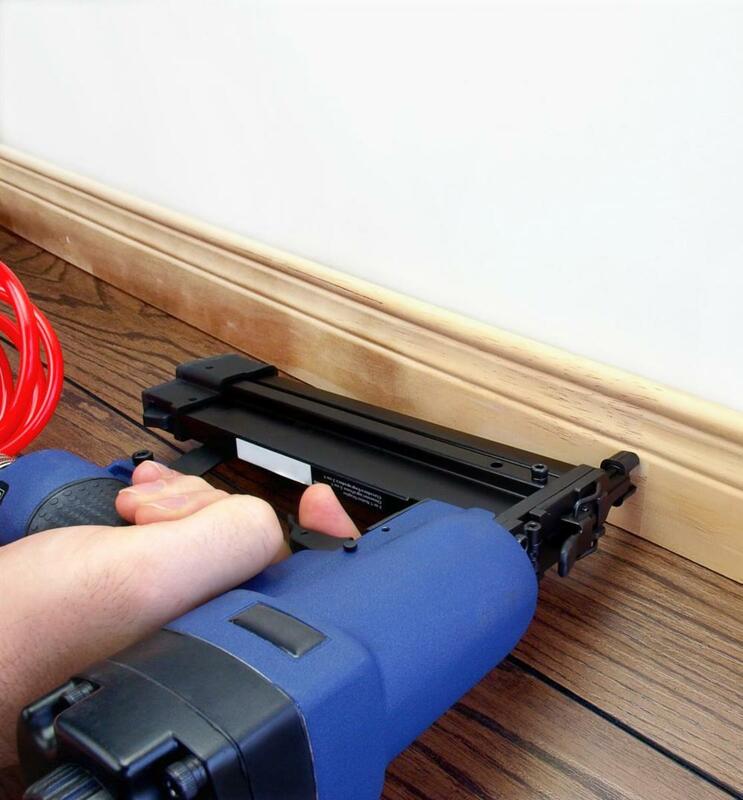 If you are fixing down ply as part of flooring preparation, for instance, you just 'bump' the head of the gun against the surface and it fires. Alternatively, the gun can be set to fire at regular time intervals. 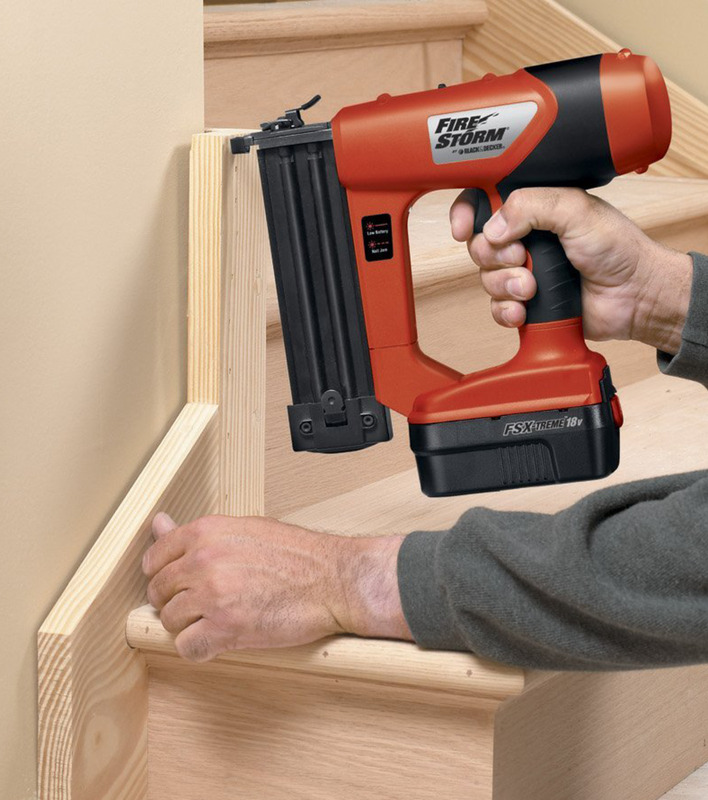 Angled nail guns are easier to use in difficult spaces and for trim work. Straight nailers are better for benchwork, you are guaranteed a straight drive. The most important thing is to get the right kind of gun for the jobs you have in mind. 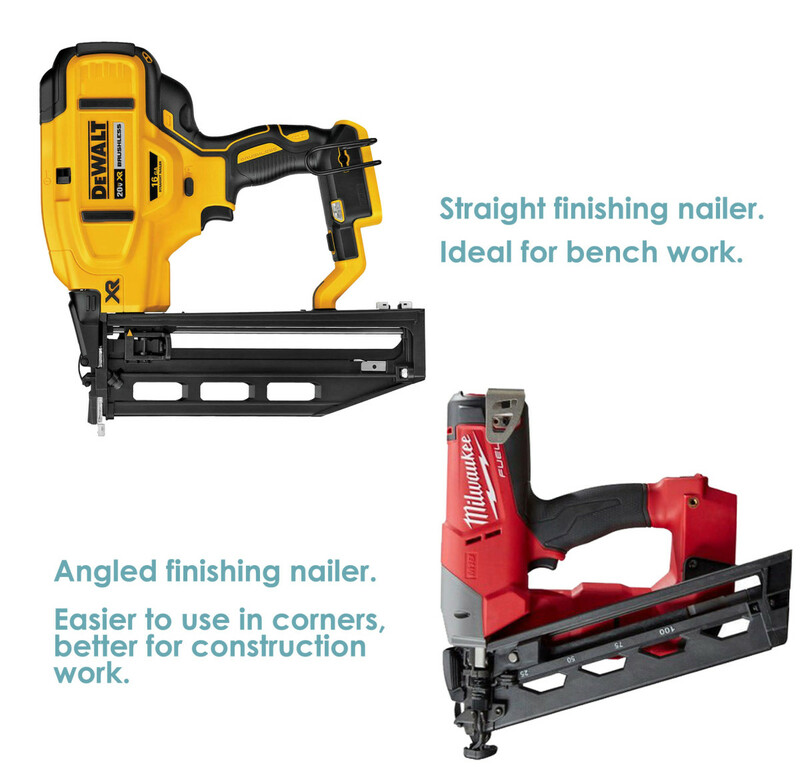 Just to repeat: framing nailers are for structural work and deliver big nails, finishing nail guns deliver small to medium-sized nails for more delicate work. If you are looking for a tough, powerful machine- whether it is for framing or finishing- expect to pay around $350. For light work, something like a Black and Decker nail gun will give good service for less than $100. Below, are some of the best representatives of fuel cell powered and cordless nail guns around right now. This is not the lightest finishing nailer and it certainly isn't the cheapest at around $350 online and $400 in many stores. On the other hand, it is perhaps the best overall for finishing work. 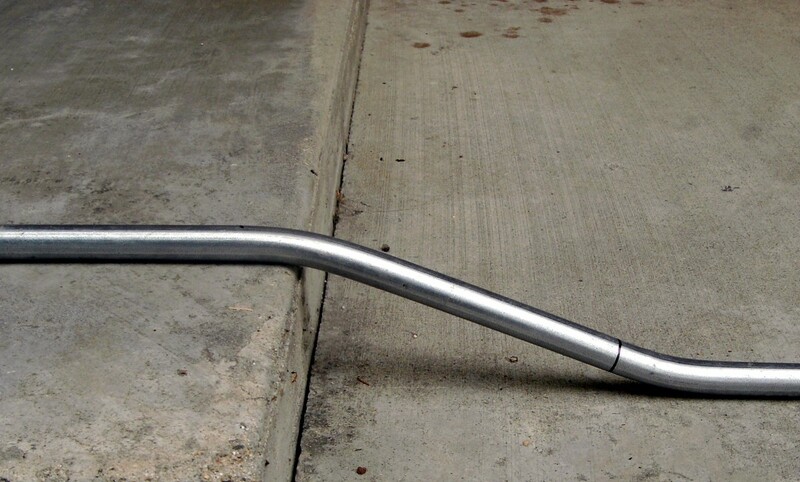 This is the kind of tool you need if you thinking of doing a lot of DIY or pro work. 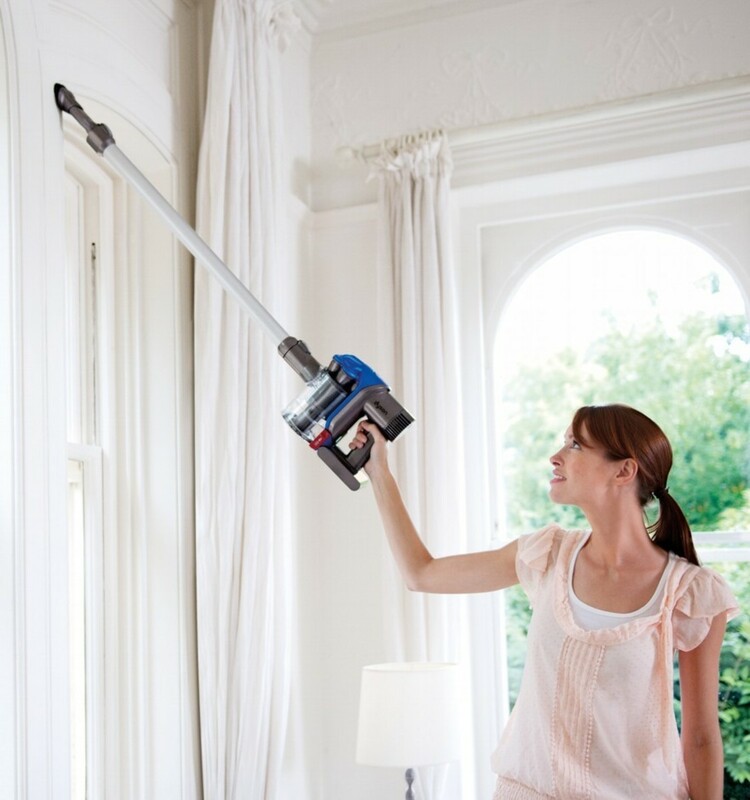 It is perfect for fixing any kind of moldings. It leaves a neat hole and will strike deep enough in hardwoods like oak to need no nail punches afterwards. There are a whole range of useful features. It can be set to fire nails at time intervals. It has a bump mode. Built in LED lights make working in gloomy corners easy. It has a belt hook and an easy safety switch to lock off when not in use. The real advantage is its sheer power. You can move at speed with this machine- it delivers five nails a second. It is comfortable with 16 gauge nails from one and a quarter inches to two and a half inches. Straight which are ideal for bench work, upholstery, cabinet making, flooring and any application where you don't need to get into awkward spaces. It is also easier to judge vertical with a straight nail gun. 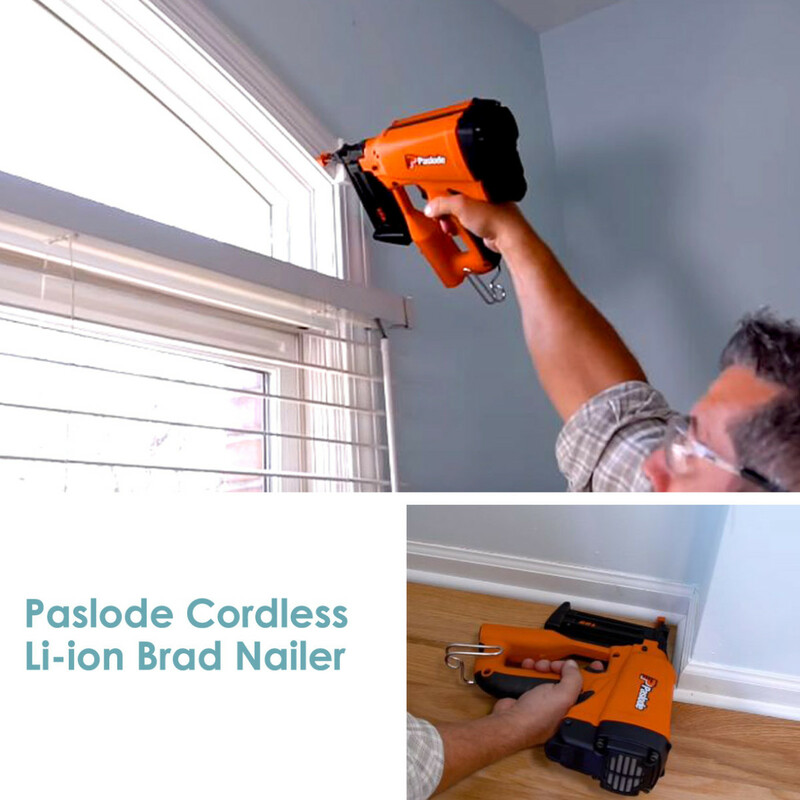 The 7V Li-ion, Paslode brad nailer pictured above, is remarkably light at around four and a half pounds, which is useful for overhead work. It is also very compact and, with a short nail magazine, it is pretty agile, reaching into awkward places better than most. 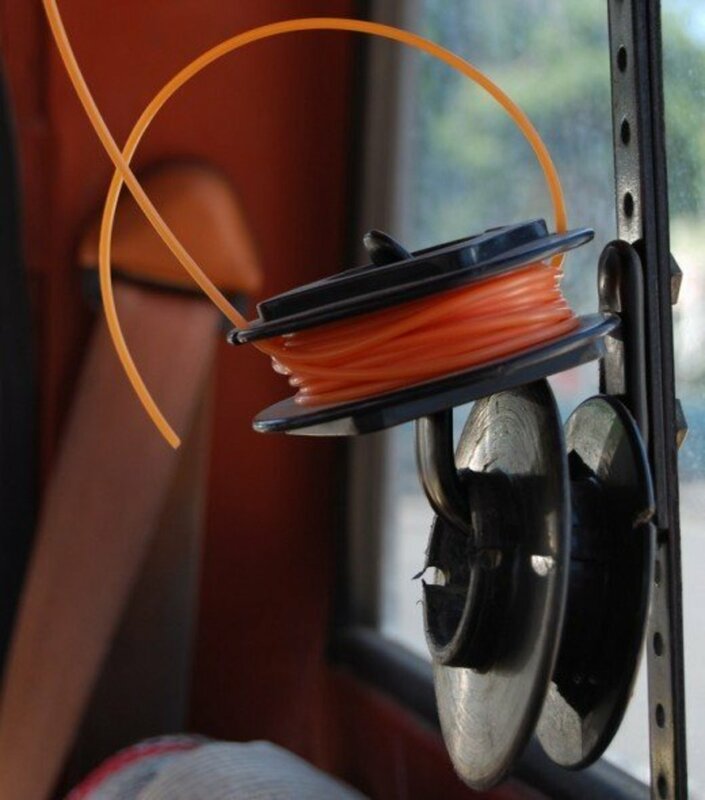 A lockout mechanism makes it impossible to shoot when empty and there are special tips that will not mark the surface you are working on. Shoots three quarter inch to two and a half inch nails. Best Economy Finish Nail Gun? Not everyone is planning to use a nailer everyday. And some of the nailers on this page really are designed to be tough enough for everyday use. The AirStrike 18GA from Ryobi (pictured above) is half the price of a comparable De Walt but features easy drive selection (multiple or single) and depth selection adjustments. 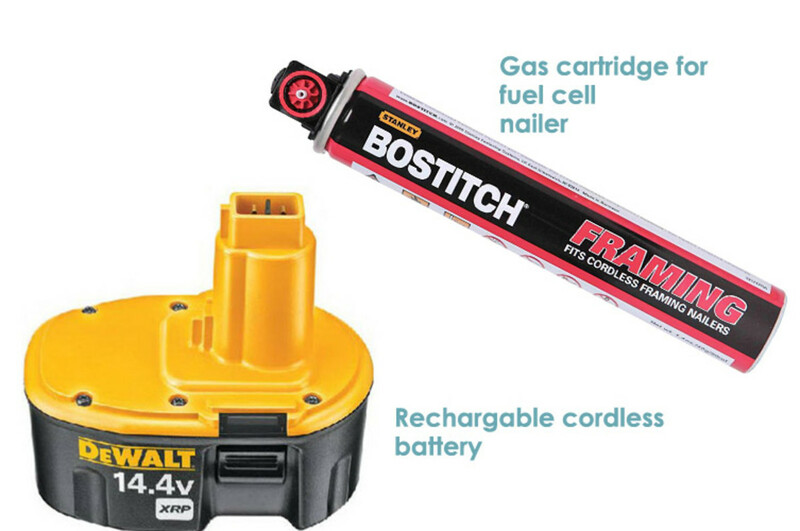 The 18V power source will cope with tough materials. 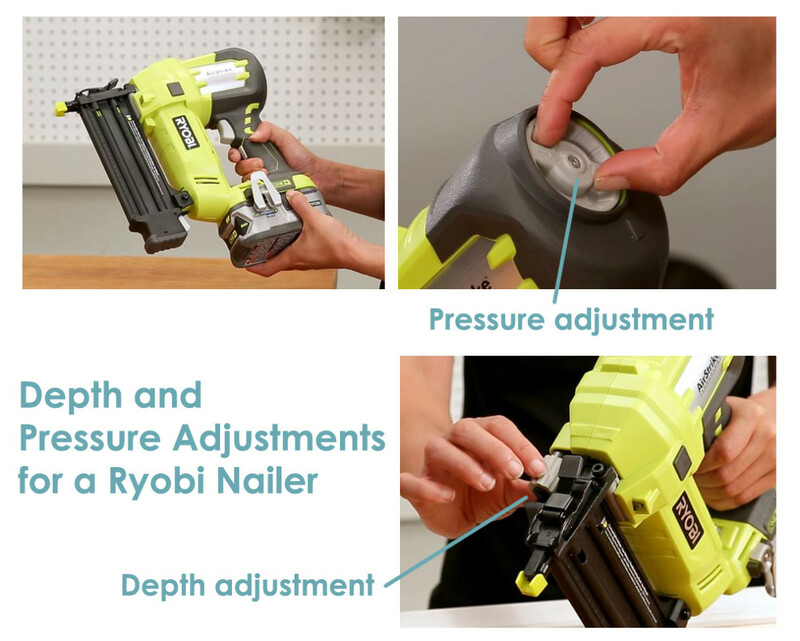 Ryobi makes AirStrike, straight and angled nailers. They are easy to find at Home Depot. This is a powerful 18-Volt 18-Gauge nail gun that should satisfy the needs of DIY hobbyists. It is not the quickest gun in the world- after you press the trigger there is a noticeable delay before it fires. At the same time, if you are a patient worker it will get the job done. There is no bump mode. The two year warranty (Black and Decker always honor their warranties) should get rid of any worries about durability. A sample of tried and tested nailers for heavy-duty structural work. 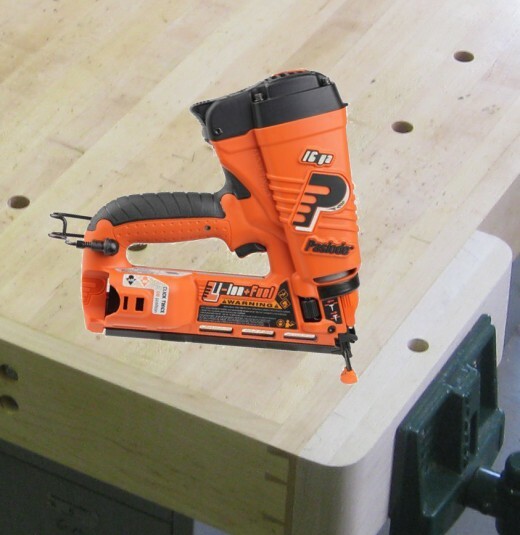 The Paslode 900420 is a great nail gun for remodeling work inside, or things like deck, shed and fence building. Two inch to three and a quarter inch nails are driven problem-free through softwoods for quick fixing of flooring, door and window frames and countless DIY jobs around the home. It uses a fuel cell together with a battery to deliver the power The latest model (shown right) drives up to 1,200 nails on a single fuel cell and around 4,000 nails on a full battery charge. It has overcome all of the problems that plagued earlier models like freezing or running too hot and is good enough to have replaced many compressor driven nail guns on construction sites across the US. At under five pounds most people can handle it easily- and it's a lot less tiring than fighting with an air hose. Hitachi NR90GC2: Clipped Head Framing Nail Gun, Gas-powered. Uses 2-Inch to 3-1/2-Inch clipped head nails. If you need round head nails you should avoid this model. See graphic below for a small part of the endless clipped head versus round head nail debate! Even the larger nails can be driven at the rate of two per second which is quick enough for a framing nailer. 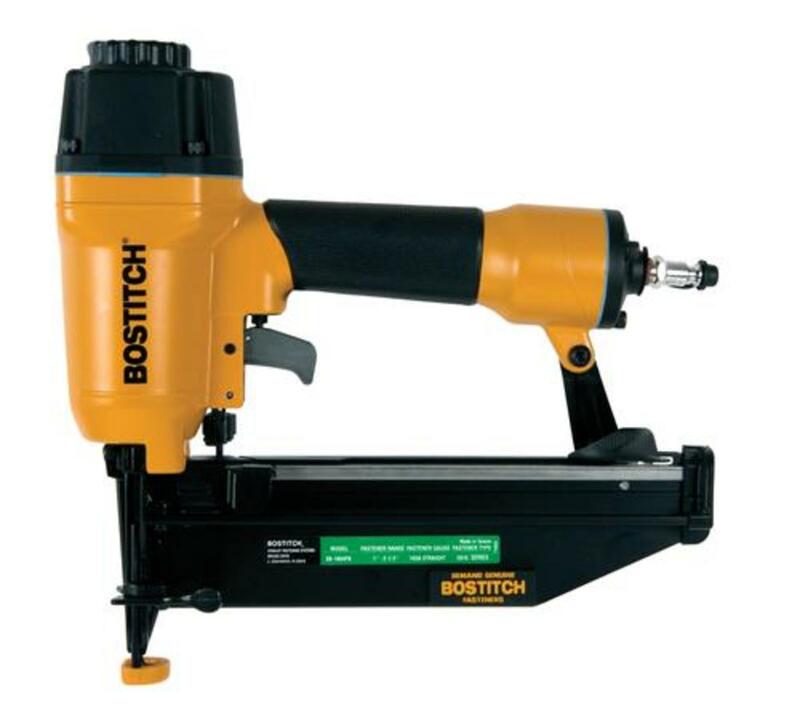 It has a comfortable grip and weighs noticeably less than the DeWalt featured above. It has a dry fire prevention system. The nail depth is adjustable. It weighs just under eight pounds. 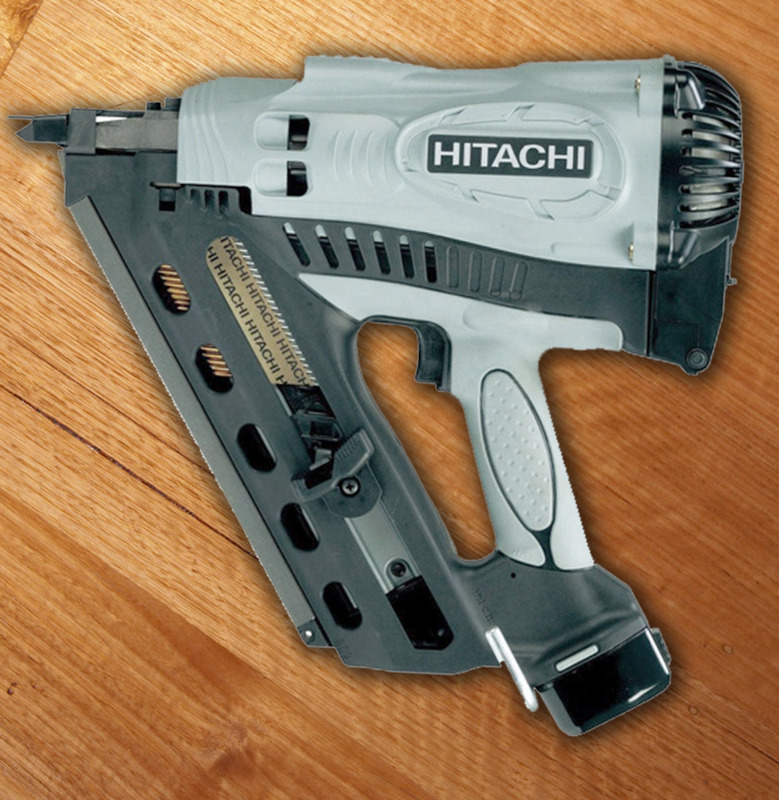 Hitachi Nail guns have a reputation for robust reliability second to none. It would be my first choice for a cordless nail gun. 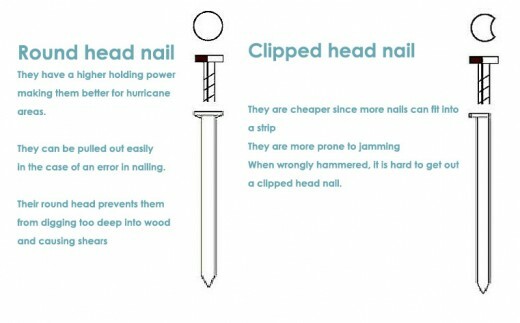 Pros and cons of clipped head and round head nails. Nail Guns can be Dangerous! The video below illustrates some of the bad practices that can lead to a lot of unnecessary pain. 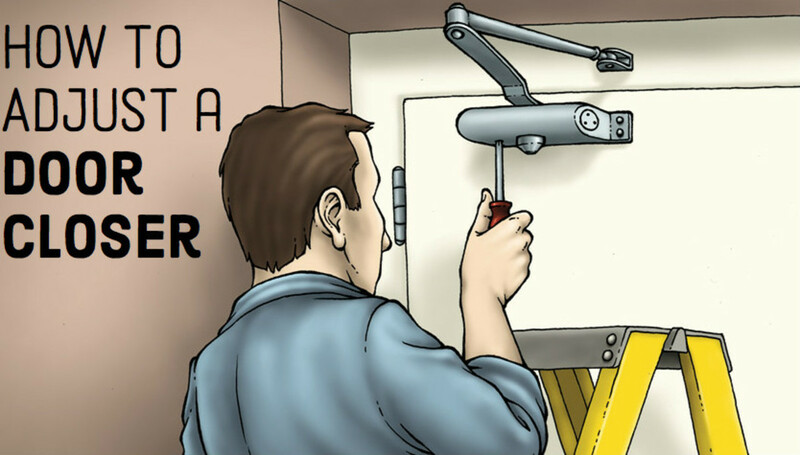 Which Type of Nail Gun or Nailer Do You Need for the Job? What about Hilti? 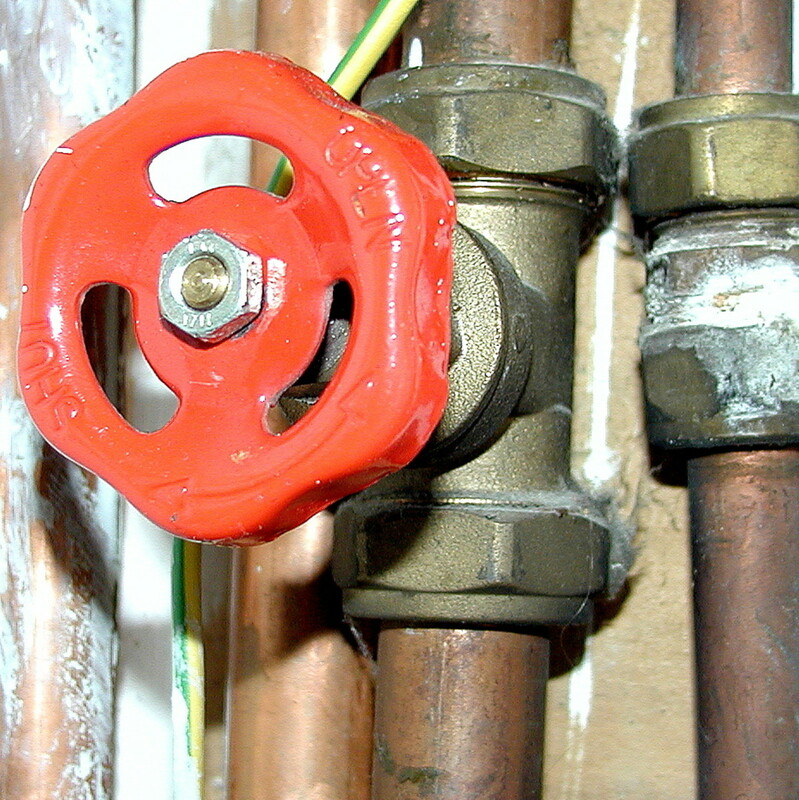 They invented this type of fastener... Try looking up the DX 5 or the cordless BX guns. Their tool repair and after sales service is the best in the world. Plus they are leaders in the IOT integration into their tools. I have the paslode finishing gun and it is absolute rubbish couldn't even finish putting arcitraves around 1 window before it gave up don't pay a fortune for rubbish. That is an issue that I should have mentioned. Thanks for that comment, Andy. I'm still using compressor guns, probably time to have a battery powered unit. Thanks for the help. The nail going through the carpenters thumb brought back some memories! I am still a big fan of the Paslode guns. I have a 30 degree framing nailer and a 30 degree 16 gauge finish nailer and they are so much better than dragging and air compressor and hose around with you. Great article!